Mieczsław Weinberg, also known as Moisei or Moyshe Vaynberg (1919-1996) is surely one of the twentieth century’s most important and least known composers. He was born in Warsaw, the son of a violinist and Yiddish theater music director and graduated from the Warsaw Conservatory with a degree in piano in 1939. That year Weinberg fled the Nazi invasion of Poland, settling in Soviet Minsk, where he studied composition at the Belorussian State Conservatory. After Hitler’s invasion in 1941, he relocated again, to Tashkent in Soviet Central Asia. There he met his wife, daughter of the Soviet Jewish theater director and political leader Solomon Mikhoels. 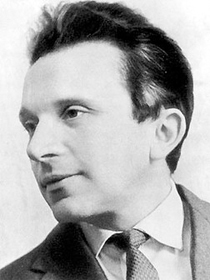 In 1943, Weinberg’s first symphony came to the attention of Soviet composer Dmitri Shostakovich. The result was an immediate friendship that subsequently defined Weinberg’s musical and personal life. With Shostakovich’s assistance, he moved to Moscow, quickly establishing himself as the latter’s junior colleague in the world of Soviet composers of the 1940s and 1950s. Over the next several decades Shostakovich and Weinberg developed an extremely close friendship and artistic conversation that influenced both men profoundly. From Shostakovich Weinberg acquired an aggressive modernist musical style, while the older musical master appears to have been directly exposed to the world of East European Jewish folk music and Yiddish poetry through his younger colleague. Both even quoted from one another’s compositions in their own works. From the mid-1940s, Weinberg wrote several works with Jewish themes, including two song cycles, both named “Jewish Songs,” based on the texts of Yiddish poets Y. L. Peretz (op. 13) and Shmuel Halkin (op. 17), his clarinet sonata and quintet, and other works that drew on klezmer music and Yiddish folk song traditions of Jewish Eastern Europe. By the late 1940s, Weinberg had emerged as a leading Soviet composer. However, he soon found himself personally caught up in the Stalinist post-World War II anti-Semitic repression against Jewish cultural and intellectual figures and institutions. Weinberg’s Jewish musical explorations together with familial links to high-profile regime targets such as Mikhoels and the physician Miron Vovsi led to his arrest and imprisonment in February 1953. Upon the death of Stalin one month later, he was released and went on to a highly successful and prodigious career as a composer of numerous chamber and orchestral works, including 17 string quartets, 26 symphonies, 4 operas, and more than 60 film scores.